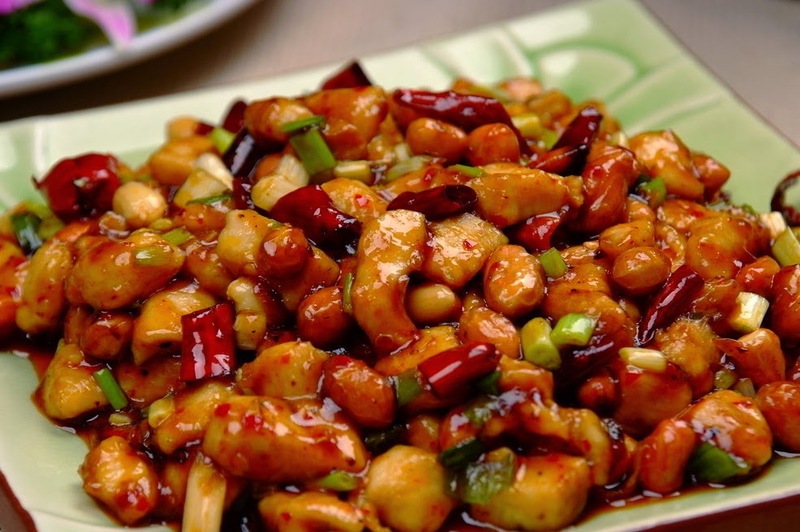 The secret of making Kung Pao Chicken is to first season the oil with ginger, garlic, and dried chilies. Make sure to open the window and turn on your exhaust fan when cooking the chilies, as the aroma can he very strong. Use the whole dried red chilies that are 3 to 4 inches in length. The heat often varies, depending on the freshness of the chilies. 1. Preheat the oven to 375°F. In a medium bowl combine the chicken, 2 teaspoons of the soy sauce, the 1 teaspoon rice wine, the cornstarch, and sugar. 2. In a small bowl combine the broth, vinegar, and the remaining 1 tablespoon rice wine and 2 teaspoons soy sauce. Set aside. Scatter the peanuts on a baking pan and roast 7 to 10 minutes or until golden brown. Set aside to cool. 3. Heat a flat-bottomed wok over high heat until a bead of water vaporizes within 1 to 2 seconds of contact. Swirl in 1 tablespoon of the oil, add the garlic, ginger, and dried chilies, and stir-fry 20 seconds. 4. Carefully add the chicken mixture, spreading it evenly evenly in the wok. Cook undisturbed 1 minute, letting the chicken begin to brown. Then, using a metal spatula, stir-fry 1 minute, or until the chicken is browned on all sides but not cooked through. Transfer to a plate. 5. Swirl the remaining 1 tablespoon oil into the wok over high heat. Add the bell peppers and stir-fry 1 minute or until slightly softened. Return the chicken to the wok. 6. Stir the broth mixture, swirl it into the wok, and stir-fry 1 minute or until the chicken is just cooked through. Add the peanuts, salt, and scallions and stir-fry 30 seconds or until the scallions are bright green. Discard the chilies before serving.